Bad site, no warning from WSA! 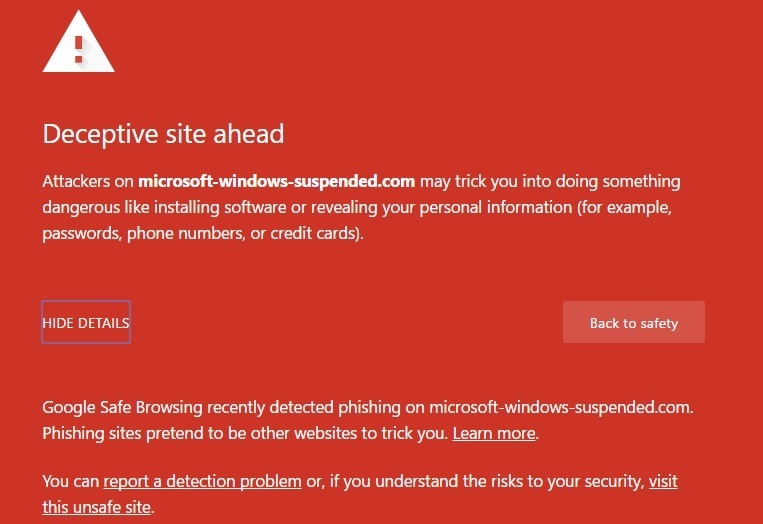 That first item is a link to a site where your computer stars beeping claiming to be from MS warning of an intrusion on your PC with a number to call. You can’t close, all you can do is a Crl/Alt Del and kill it. 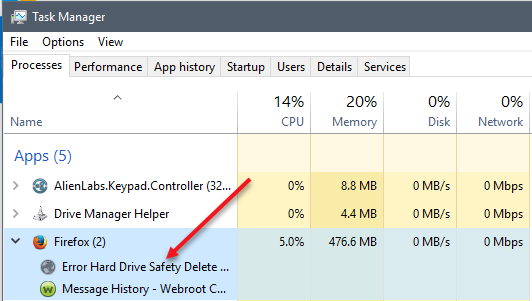 WebRoot, why doesn’t this site have a red warning on it??? It doesn't appear all the time, next time I'll use the link. It popped up again with a search so I copied it, tried it verify it again and submitted it. It was given a score of 81 with a green check mark! Seriously? Well, just tried the link that you just posted and...absolutely no problem accessing the site/no sign of any warning or impediment to access. Not really sure what is the matter other than I suspect that it is related to something with your specific system and/or configuration. I would advise Opening a Support Ticket, as the best way to get to the bottoim of what is causing this. I got it with Firefox! Had to kill the page with Task Manager! Good, I submitted a support ticket on it. Did one of guys remove my link posted above to keep others from trying it? Which is good, just asking. I sent an email to Webroot as well! Nasty little bugger that link was! Not for me! Is there a way to force WRSA to update? Ah! Now it blocked it. 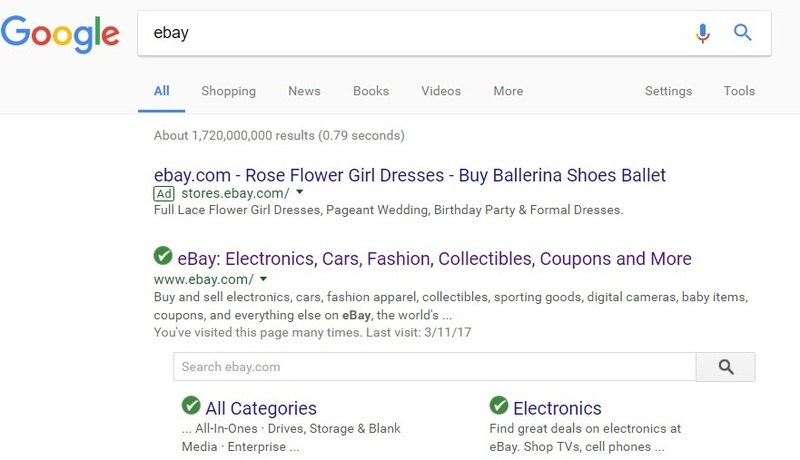 But from a Google search for "eBay" with Google Chrome when it comes up still takes you to that site, no blocking then!! Right as I corrected my comment! It will take a few days! I sent Webroot BrightCloud Threat Intelligence Support, the answer will come on Monday. From the Google search, I now get this. Ads aren't the point here, a dangerous site posing as an ad is. and AdBlocker blocks user from seeing Ad in search results. Why not filter out dangerous anyway you can? I added the AdBlocker extension but it still showed up. I wouldn't think it needs a reboot. It's gone now but that's normal as it doesn't show up on every search for some reason. Thank you very much for reporting these deceptive websites. 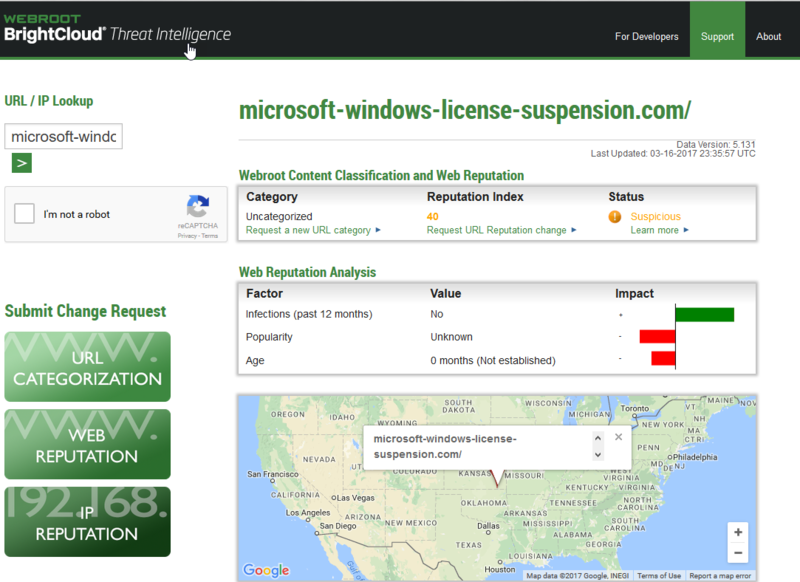 microsoft-windows-suspended.online and microsoft-windows-license-suspension.com have been classified to the Phishing and Frauds category. Please allow at least 24 hours to see this change. 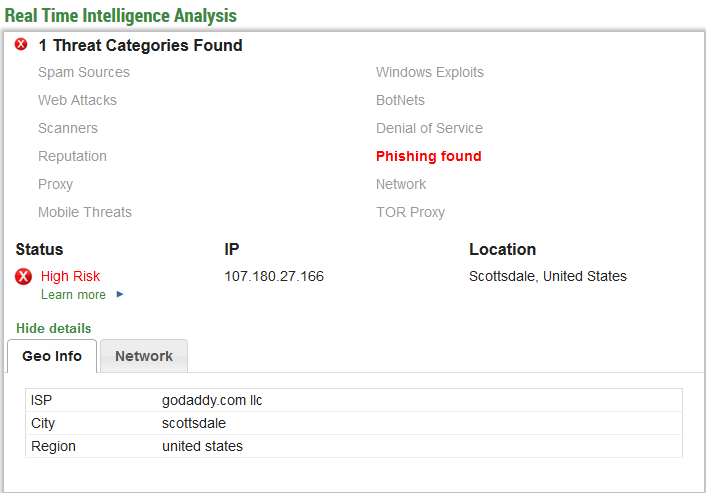 Webroot BrightCloud Threat Intelligence Support"